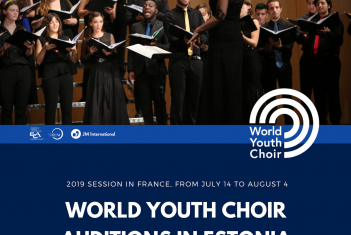 World Youth Choir is looking for young, talented, experienced singers between 17 and 26 years old, as on July 1st, 2019 (obligatory), interested in improving their skills of choral singing from 14 July to 4 August 2019. The ten days of rehearsals will take place in Millau or Saint Affrique (France). The concert tour will take the 2019 WYC to the International Festival of Sacred Music/World Music at Sylvanès Abbey, Lisbon (Portugal) and will end at the Choralies festival in Vaison-la-romaine. You'll find more detailed info on the summer session, conductors and repertoire on the homepage of the choir. 2) Sight-reading - an unknown exercise that is not prepared in advance. You can use up to 10 minutes to look the exercise through (not using a piano, except for the introduction pitch/cadenza), analyze all tonal and theory components. Then record at first attempt in front of the jury. 3) Prepared score - obligatory choral excerpt from K. Nystedt's "O Crux". It should be sung from bar 1 to bar 24 and from bar 44 with upbeat to 52 2nd beat.